McNichols Civic Center Building is a 30,000 square foot neoclassical landmark in the heart of downtown Denver's Civic Park. It was recently renovated in 2012 after years of sitting idle, and now boasts a modern fresh look that serves as a wedding venue, meeting and arts space. It now has a modern look inside, with high ceilings and a chic industrial feel. The walls are decorated in art work, meaning you don't need to decorate too much to make the space work for any style. This wedding that the photo was taken at was a larger Jewish wedding with hundreds of guests. The whole festivities happened within the building, with one floor dedicated to the bedeken and the wedding ceremony, and the upper floor for the reception and horah dancing. They signed the ketubah on the lowest first floor, then made a procession up the staircase to meet the bride for the bedeken. The wedding ceremony took place at dusk, in line with the tradition, and was lit with hot lights to create a focus on just the ceremony happening. 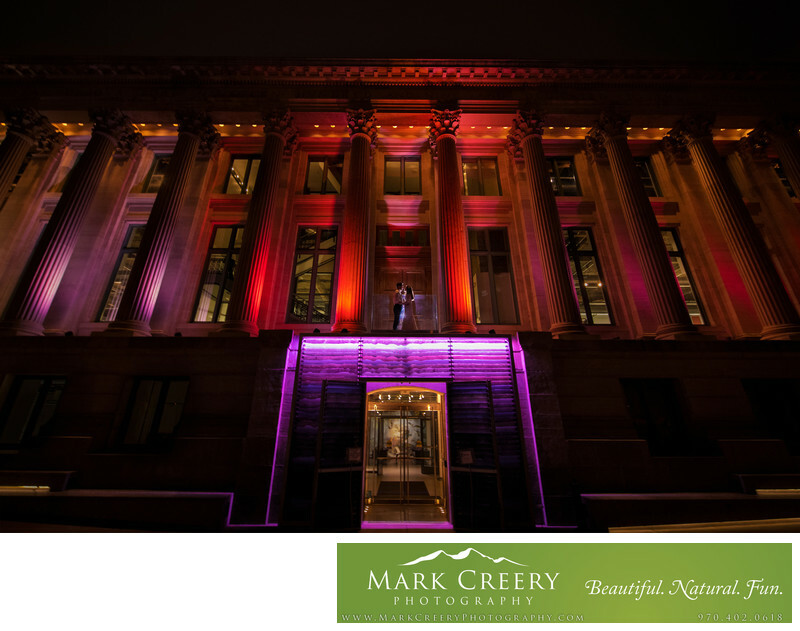 In this night photo, the bride and groom went onto a small balcony outside so I could capture them among all the colorful up lights. I used a slow shutter speed with an off-camera flash behind them to illuminate them and capture the ambient light. McNichols Civic Center Building is located in Denver, Colorado next to Bannock and Colfax. Contact booking information: Julie Pomerantz, julie.pomerantz@denvergov.org, 720-865-5555. Location: 144 W Colfax Ave, Denver, CO 80202.